Instead of maturing a hideout, Dracula may convert a hideout to a lair by placing it on one of the three lair slots on the side of the board. If a hideout contains a sea location, it cannot be converted to a lair. When a hideout becomes a lair, Dracula places an encounter card from his hand on the lair. As such, a lair can have multiple encounter cards on it. When Dracula moves during future phases, he can move to a lair by placing that lair on the first space of the trail, converting it back to a hideout-to do this, Dracula must be able to move to the location in that lair following normal movement restrictions. When Dracula places the lair on the trail, he still places another encounter card on that space as if he had placed a location card from the location deck. Dracula may clear a lair at any time, and he must clear a lair if all encounter cards are removed from that lair. One benefit of using lairs is that there are more locations with encounters that Dracula can use to ambush hunters. Also, since an additional encounter card is placed on the lair, this allows Dracula to draw more encounter cards, increasing the chances of drawing more vampire encounter cards. This card allows Dracula to recover damage. To use "Feed", Dracula places this card on the first space of the trail instead of moving; he does not place an encounter card on it. Then, he recovers up to three damage. This card allows Dracula to draw more encounter cards. To use "Dark Call", Dracula places this card on the first space of the trail instead of moving; he does not place an encounter card on it. Then, he suffers two damage and draws five encounter cards. There is no limit to the number of encounter cards that Dracula can have in his hand. This card alters the way in which Dracula can move. 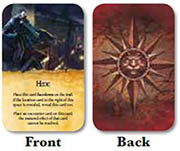 To use "Wolf Form", Dracula places this card on the first space of the trail along with a facedown location card from his location deck. Then, he suffers one damage. The location card Dracula chooses can be up to two cities away from his current location by road, allowing Dracula to move further and pass undetected through an adjacent city that a hunter occupies. This card allows Dracula to clear a hideout on the trail. To play "Misdirect", Dracula chooses a hideout on the trail and clears it. Then, he places "Misdirect" on the space of the trail that was cleared. After placing "Misdirect" on the trail, Dracula places a card (location or power) on the first space of the trail as normal. Dracula cannot use "Misdirect" to clear a hideout that contains a power card, Castle Dracula, his current location, or a location that is associated with "Hide". This card has the same card back as the location cards and allows Dracula to mislead the hunters by pretending to move while staying in the same location. To use "Hide", Dracula places it facedown on the first space of the trail and places an encounter card on it. Dracula cannot resolve the matured effect of that encounter card. Hide is associated with the previous location that Dracula occupied as long as that location remains on the trail. As such, if a hunter ends his movement on a location that is associated with "Hide", Dracula can ambush a hunter using encounter cards on both that location and the "Hide" card. If a location associated with "Hide" is revealed, the "Hide" power card is also revealed. Rumor tokens represent gossip, perhaps started by Dracula himself or from superstitious locals seeing someone, or something, they could not explain. Dracula can use rumor tokens to further advance the influence track or potentially distract hunters who are close to his trail. 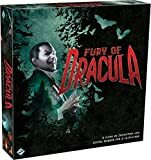 Dracula begins the game with one rumor token (see "Advanced Game Setup" on page 2 in the Rules Reference), and he gains an additional rumor token each time a despair token is placed on the time track. After Dracula places an encounter card during the Dracula phase, Dracula can place one rumor token on one of the hideouts on the first three spaces of the trail. 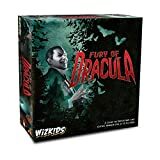 If Dracula matures a vampire encounter from a hideout that contains a rumor token, he advances the influence track by an additional three spaces. A rumor token remains as part of a hideout or a lair until there are no encounter cards on that location card or the location card on that hideout or lair is returned to Dracula's location deck. When a rumor token is removed from a location or hideout, it is returned to the token pool.